Suspended culture oysters have thinner, more delicate shells than their intertidal counterparts. Serving the perfect oyster on the half shell requires careful shucking. The oyster knife should be inserted through the hinge since this is the thickest part of the shell. 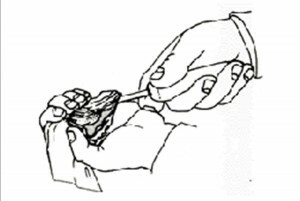 Even experienced shuckers should wear gloves to protect their hands while handling suspended culture oysters because of the sharp fluting typical of these shellfish. 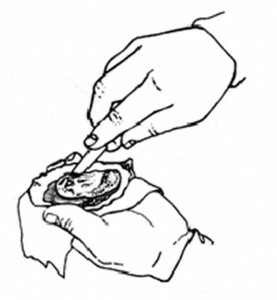 Place the oyster cup-side down firmly cupped in the palm of your hand with the hinge pointed toward Your body. Insert the point of your shucking knife between the upper and lower shells at the hinge. Apply pressure while slowly rocking the knife point back and forth between the shells. Once the hinge is broken, twist the knife to pry the shell open about one-half inch. Slide the knife along the upper (flat) shell to about midpoint until encountering the adductor muscle. Sever the muscle from the flat shell, freeing the flat shell. Be careful to contain the liquor (oyster juices) in the cupped shell. Discard the detached flat shell. 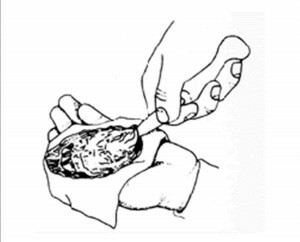 Slide the shucking knife along bottom of cupped shell until the adductor muscle is severed. Flip the oyster meat in the cupped shell for the best visual presentation.